I know what you’re thinking. What could be better than pumpkin pie? 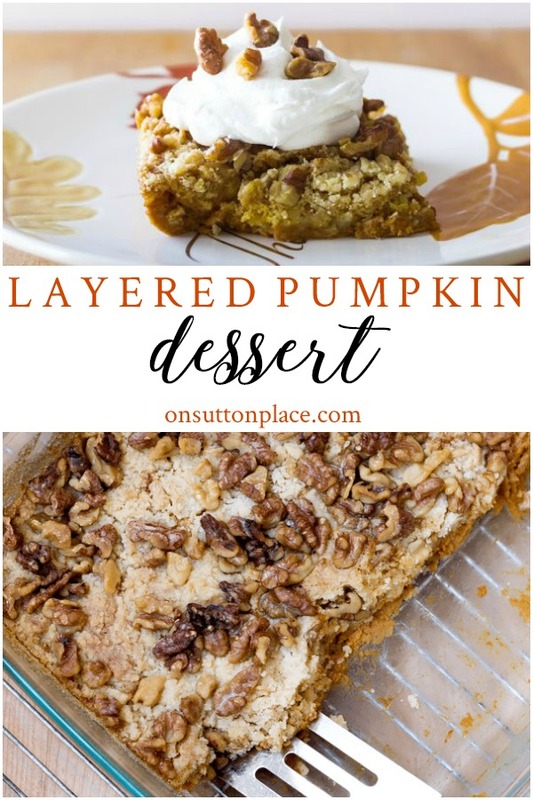 Well…this layered pumpkin dessert with yellow cake mix is easier and in my opinion, better than a piece of pie! Six ingredients and just a few minutes is all you need to mix up this layered pumpkin dessert and put it in the oven. One of the reasons this pumpkin dessert so quick is because it calls for a yellow cake mix. It’s delicious served warm with whipped cream, ice cream, or my Brown Sugar Whipped Topping. It can be refrigerated for up to three days and can be made ahead if need be. Be careful though, because you might find it gone if you make it too soon! Six ingredients and just a few minutes turns out this layered pumpkin dessert with yellow cake mix. It's the perfect Thanksgiving dessert idea! In a large mixing bowl, beat pumpkin pie mix, evaporated milk and eggs until well mixed. Pour into greased 9 x 13 pan or two 8 x 8 pans. Combine butter and cake mix. Use a fork or your fingers to make sure all the butter is incorporated into the cake mix. Sprinkle the cake mix/butter mixture on top of the pumpkin mixture. Remove from oven and sprinkle walnuts on top of cake mix. Bake for 30 minutes longer. The top should be a golden brown and your walnuts will be roasted. Serve with whipped cream, ice cream, or brown sugar whipped topping. If made ahead and refrigerated: warm for a few seconds in the microwave and it tastes like it just came out of the oven. I didn’t use all of the cake mix. There was probably about 1/2 c. left in the bowl when I decided there was enough! A little bit of this goes a long way because it’s rich and filling. Small pieces can be served which means you can feed a crowd. Versions of this dessert have been roaming around Pinterest for a long time. I think there’s one that calls for pouring melted butter over the cake mix. I don’t know if I could bring myself to do that. In this version the topping is more like a streusel and the walnuts were my idea. I think they add the finishing touch. I’m not sure I’ll ever make a pumpkin pie again. Let’s be honest…Thanksgiving is a lot of work. There is planning and preparation, time spent in the kitchen on your feet. Why not try something that might lighten the work load? 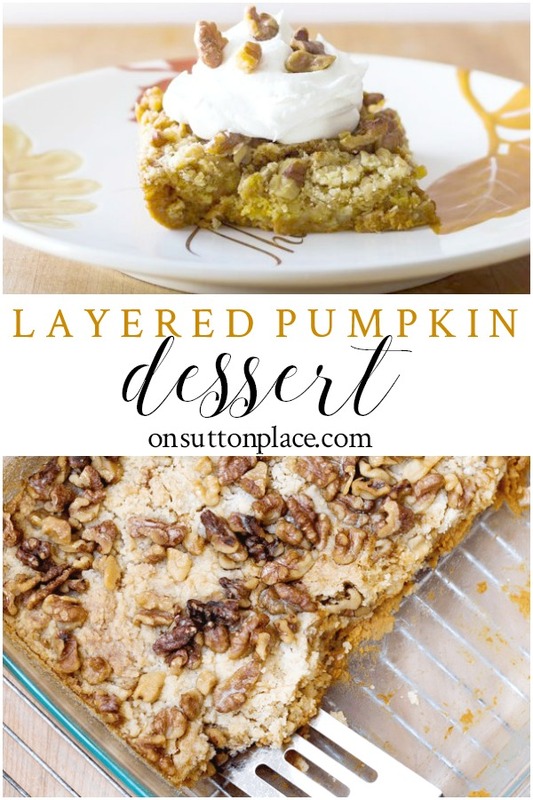 Here are a few more pumpkin dessert ideas…for Thanksgiving or anytime! Thanks very much for stopping by…see you soon! Oh my gosh, I have been making this for 25 years and my family loves it!! I have found it to be much quicker and easier (also less messy) to zap the butter for a few seconds in the microwave, and quickly pour it over the top, than to cut the butter into the cake mix. The result is also a yummy streusel. I always use pecans, but walnuts are great also! You post the best recipes! And, we ALL love easy AND delicious!! I made your apple bundt cake and it was delicious! I will try this one next. Thanks for sharing! Made the better than pumpkin pie for church today. It was a hit. Thank you! That will be on the dessert table at my Thanksgiving! Thanks! 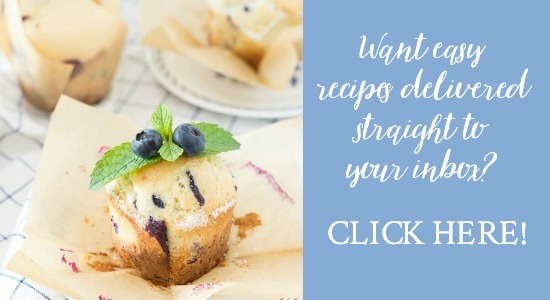 Thanks for another great recipe for my Pinterest collection! This one will be getting a workout over the holidays…and I’ll probably need an extra work out or two after indulging! Ann, I want to try this for our church breakfast. But what is Libby’s Pumpkin Pie Mix? Sorry, is this canned pumpkin with the spices? 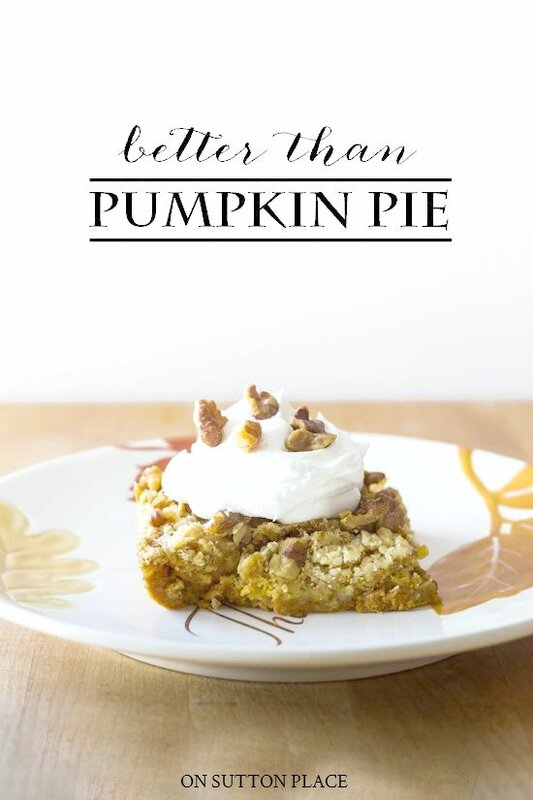 Please reply, as I love pumpkin pie and this sounds DELICIOUS! Libby’s Pumpkin Pie Mix is right on the shelf beside the regular cans of pumpkin. I will add a picture to that post so you can see what the label looks like. Enjoy! This pumpkin nut is going to try it! Sounds sooo good. And as always, your photos sell it. Just made this recipe and it is light and creamy and yes, much better than pumpkin pie! This will now be my “go to” Fall dessert. It is heavenly!!! For the cake and butter part of the recipe, when mixing, am i looking for a crumbly texture? I am not sure when to stop adding the cake mixture, its looking like dough at the moment…. Hello, this recipe looks scrumptious. I do have a question however, does this recipe call for salted or unsalted butter? What is your Etsy name. I love your blog…everthing you do has ‘a touch of class’. Do you really mean pumpkin pie mix and not pumpkin puree? Most pumpkin dump cake recipes are very similar but use pumpkin puree. Yes…I used the pumpkin pie mix. I had never used it before and it’s very much like the puree. It set up nicely though…thanks for your comment! I don’t know how long I’ve been on your site, it’s almost an hour, maybe two. but i love everything about your designs. the photos are so nice. and now i’m hungry after looking at all the food. i want to try this recipe without baking!! i just want a bite now!! My oldest daughter will love this. Pinned it! Thanks, Ann. Looks so good!!! Can’t wait to try it! This looks sooo good! I will definitely be trying this for Thanksgiving! You can never have too many desserts, right?! :) Yum! This is REALLY good! Had to try it before serving to guests : ) so we threw it together tonight. Used fresh pumpkin puree, and I think we may have put too much in,….came out more of a pie texture and look (in the cake size and shape). Still held together well and tastes wonderful! YUMMY! I love pumpkin pie but will make this easier version to take to our family get together for thanksgiving. Pinning for later. Thanks for sharing. Mouth watering! Guess I have to go settle for the frozen apple cobbler I bought today LOL! This looks fantastic Ann! love this stuff!! 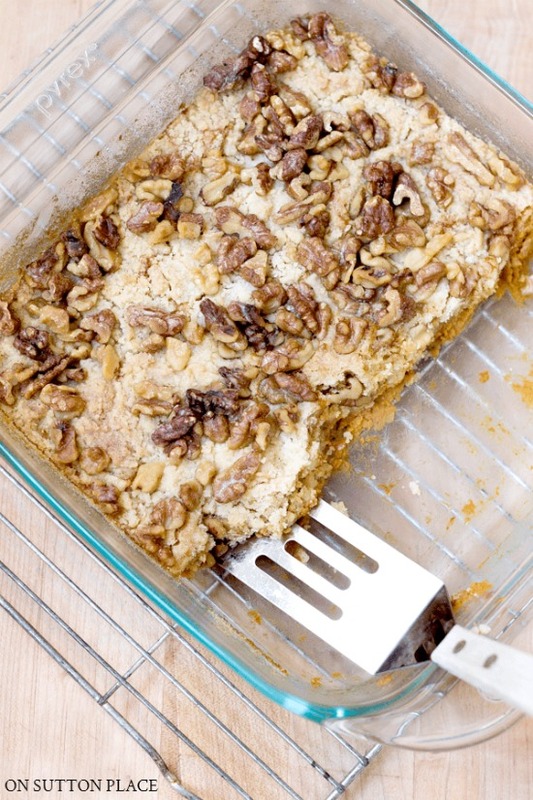 we call it Pumpkin Dump Cake, sounds yummy, huh? Looks great Ann. Will definitely try this recipe. Thanks for sharing.